This installation was intended to depict new life at an old textile factory by changing the perception of the architecture into a vision of expansion and growth. 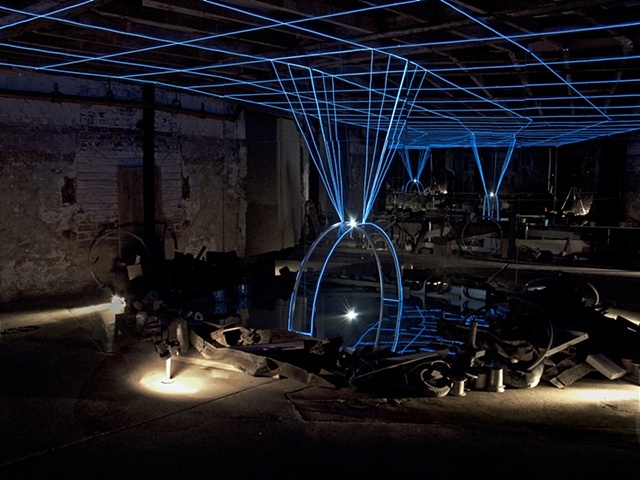 The wheel itself is one quadrant of actual material embedded in the floor using mirrored surfaces and surrounded by a border of detritus collected from the decomposition of the factory. From the wheel the overhead structure of the space is "rebuilt" as numerous strands of neon fiber advance toward the ceiling creating light panels that develop down a virtual corridor.